Editor’s Note: This quote was taken from a blog post I wrote in July of 2010 called, Making Room For Love. Below is an excerpt from that post. You can read the post in its entirety here. 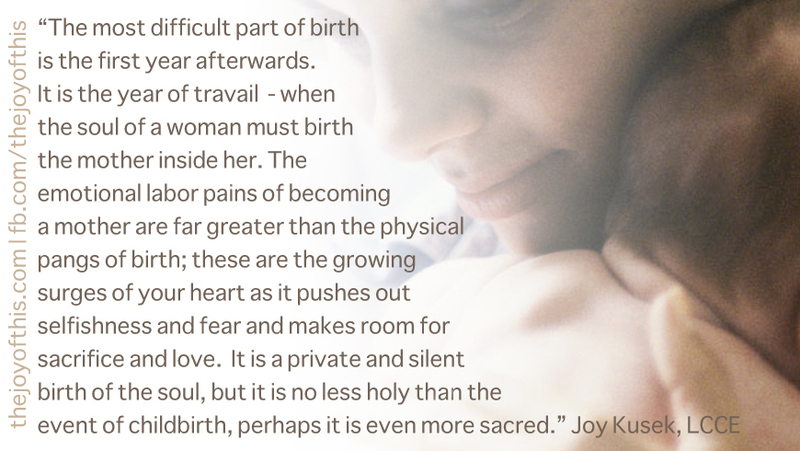 It is because of my own experience with the difficulty of motherhood that my heart is so tender towards new mothers. With deep conviction and experience, I know that the hardest part is not the 40+ weeks of pregnancy, and it is certainly not the average 12- 24 hour labor. The most difficult part of birth is the first year afterwards. It is the year of travail – when the soul of a woman must birth the mother inside her. The emotional labor pains of becoming a mother are far greater than the physical pangs of birth; these are the growing surges of your heart as it pushes out selfishness and fear and makes room for sacrifice and love. It is a private and silent birth of the soul, but it is no less holy than the event of childbirth, perhaps it is even more sacred. With great reverence and awe at the journey of becoming a mother I hold my heart up and offer thanks in learning to make more room inside my soul for love.